For anyone raised on a steady diet of Star Trek, Battlestar Galactica or Doctor Who, Dimension Drive is like the icing on the proverbial cake. 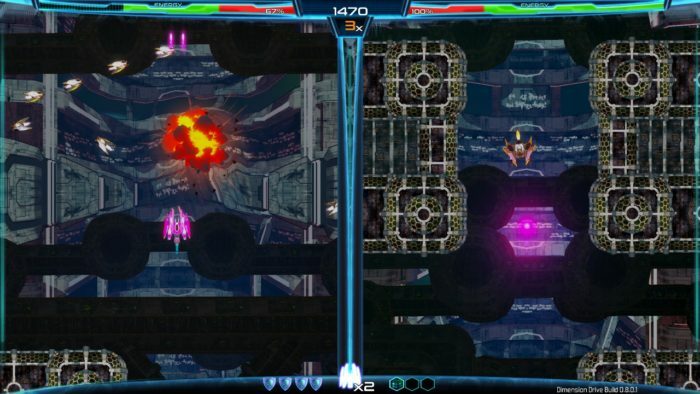 Categorically, It’s a shmup, but a shmup with a difference: Players teleport between different sides of a screen that splits straight down the middle – a unique structural arrangement composed by developer 2Awesome Studio to combat the issue of lost screen space on our modern, increasingly wider monitors. This difference gives Dimension Drive an interesting edge, because players are suddenly forced to think about when and where it’s safe to teleport on top of the typical bullet hell experience – and like avoiding assimilation by the Borg, it’s no easy feat. 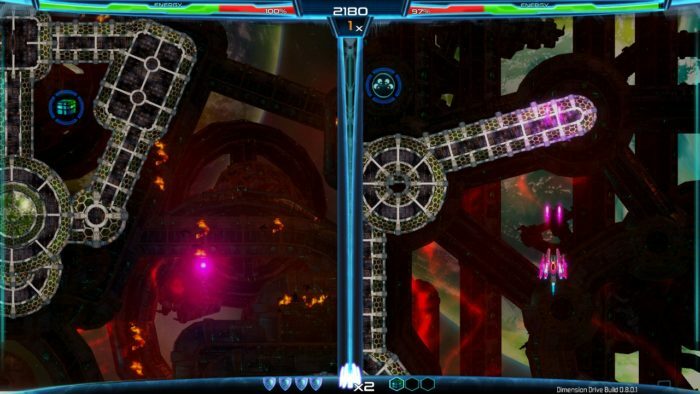 Dimension Drive comes with two player co-op and single player campaign modes that range in difficulty, essentially altering the amount of shields you have in a playthrough. Players take on the role of crimson-haired Jackelyne Tywood, a pilot entangled in a multidimensional war with the wicked Ashajul race. Thanks to a short but informative tutorial, all the ship-steering controls are fairly easy to pick up, but in terms of functionality Dimension Drive is definitely optimised for Xbox controllers rather than a mouse-keyboard combination. Playstyle aside, gameplay demands a lot of attention. Each time you shoot enemies, your energy reserve slowly depletes and can only be restored through teleportation, which ties together well with the main game mechanic and creates a sense of exhilarating tension. Aside from the mix ‘n mash chaos ensuing in my mind from continuously hopping between two screens, there comes a beautiful, synth rich soundtrack reminiscent of your childhood action packed space shooters. Something which always stands out in a video game for me is whether I pause my own gaming playlist (Which is freaking awesome by the way, shout out to Seven Lions) to listen to what the developers had in mind to complement their IP. The level design is straightforward and well constructed, it’s a game that makes you feel really good when you manage to speed run a level without taking damage or in my case, actually finish. There is a clear cut path but it takes skill to stay on it. Warp, die, repeat. Besides the warp drive mechanic, it’s a space shooter and a space shooter needs loads and loads of powerups along with new interesting enemies to keep the player engaged – Unfortunately this is what the game appears to be lacking – I know that I can’t bash the developers in their entirety for the lack of these features as the game is in early access, but the idea of picking up around 3 rotating power ups each level is something that makes the game predictable and in sometimes monotonous. Dimension Drive successfully reinvents an age old recipe by doubling the ingredients and accenting puzzles and switch mechanics. Players shouldn’t dive in expecting a full package, rather a brilliant concept which still needs a lot more additions and refinements. Get Dimension Drive on Steam today for $12.99 USD (PC, Mac, Linux).